With its symmetrically arranged, easy-grip slit projector controls, the SL 130 provides excellent support for laser therapies with the optional VISULINK®532/U in combination with VISULAS® 532s, as well as for contact glass examinations. 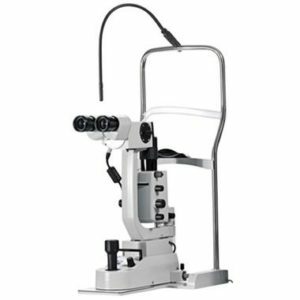 System operation is intuitive and highly accurate, enabling precise adjustments of length, width and rotated slit image. And ergonomic advances are also very much in evidence in the form of the ACCENTO® ergo tube, which supports comfortable working positions and prevents neck and back strain. The SL 130 comes with a choice of parallel or convergent tube to cater to different working preferences. The SL 130 features the SL Imaging Module, enabling image and video recording of all examinations – whether for documentation, patient consultation or presentations. The SL cam 5.0, a fully integrated, highly compact 5-megapixel camera, and the SL imaging software, combine forces to deliver high-resolution images and videos. User-specific capture settings and image review functionalities promote a smooth workflow. The SL Imaging Module is also available as an easy upgrade kit for existing SL 130 slit lamps.